At the Western base of Noriguchidake in the Japanese Alps there is a picturesque plateau. All through-out this plateau are scattered small lakes filled with sky-blue water. It has been two hundred years since this story was first told. Sitting near the base of this plateau was a small village, where lived a peasant named Heitaro. His greatest love was hunting the birds and beasts of the wild, and with the coming of winter Heitaro would venture forth with his fowling net and bow and arrow without fail. Heitaro spread out his great fowling net right in the open plains of the Road of the Dead, and waited for an unknowing thrush to fly into it. At this time, it was still in the early hours of morning. The white fog was thick, covering the ground and limiting visibility. Heitaro crouched silently, hidden in the lee of a nearby tree and patiently smoked a cigarette. After awhile, he heard a loud voice coming from the vicinity of his fowling net. Heitaro could hear someone yelling this. Heitaro peered into the fog from between the branches of his hiding place. Taken aback, Heitaro held his breath and began to shudder with fear. The voice was coming from something unspeakably terrible. At any minute it looked liked the heads would free themselves and coming flying towards Heitaro. 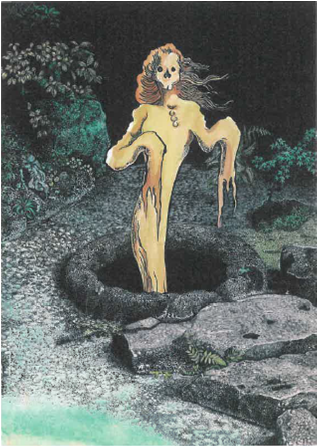 Heitaro was too frightened to speak, and quickly dove into an open cavern in a nearby rock formation where he lay shivering. Because the severed heads might be able to come down the same opening that Heitaro had entered, he closed up the hole with another rock. In time, the dense fog that enveloped the scene began to dissipate, and along with the thinning of the fog Heitaro could no longer hear the voices. Heitaro made no move to gather up his fowling net. Leaving everything behind, he started to run for his village at the base of the plateau. As he was fleeing, however, again the thick white fog began to gather around the ground until Heitaro could longer see even those things right in front of his eyes. Thinking this to himself, a long shiver ran along his spine. It was clearly the sound of someone drinking from the water. Heitaro could also hear the sound of something moving along the ground like a worm. Heitaro screamed loudly, when he saw the ghastly blue colored things rolling around on the ground. 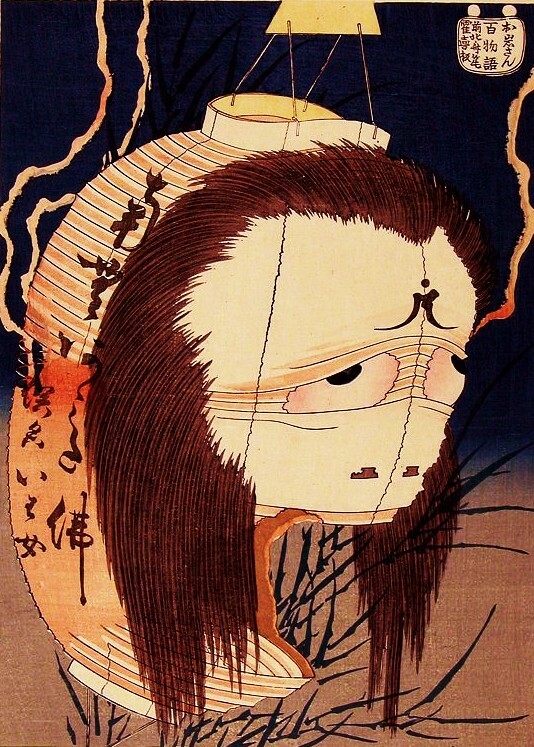 Drinking the water, dressed in white kimonos where the yurei of dead men. And there were many of them! Clinging to the banks of the lake they were pushing each other out of the way to drink from the blue water. Wanting desperately to flee, Heitaro turned to run but his legs where knocking together with terror and his feet wouldn’t move. And it was here that Heitaro was seen. In a blind panic, Heitaro drug his unmoving feet finally breaking into a run. Blindly he fled across the plateau until somehow or other he arrived at his village. But all was not well, as Heitaro could no longer go hunting and in time fell ill and succumbed to his bed. From that time forth and for a long time after, no one passed again along that route. 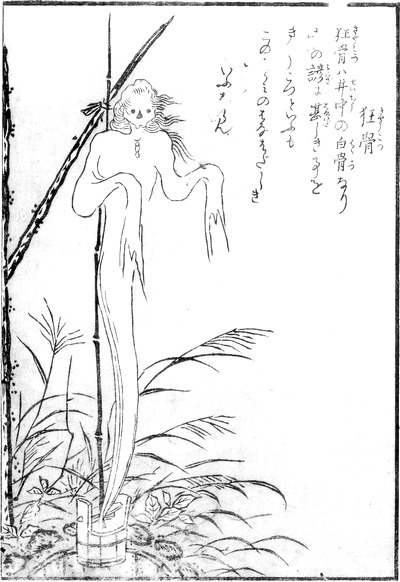 This legend is of the “Haunted Forest”-type, and is common amongst yurei tales. These same types of mysterious stories can be found in almost every area, with only the details changed to accommodate the local setting.